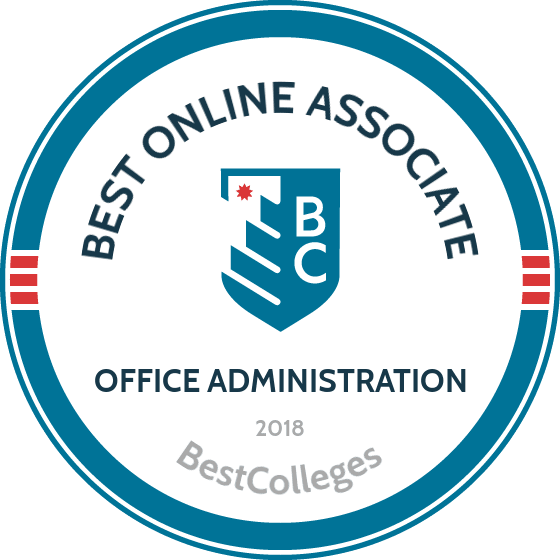 What are the Best Online Associate in Office Administration Programs? What Else can I Expect from an Online Associate in Office Administration Program? What Can I Do With an Associate in Office Administration Degree? Obtaining an office administration associate degree online can lead to a variety of administrative careers in business, communications, and health care. Office administrators with strong leadership, analytical, and communication skills can excel in their chosen career. Additionally, students who earn an office administration associate degree online can go on to pursue a bachelor's degree in a more specialized area of study, such as IT administration or project management. Qualified administrative services managers are currently in high demand, with the number of jobs in this sector expected to grow by 8% by 2024. Additionally, yearly salaries for top-ranking employees in this field can exceed $90,000. SCC is one of North Carolina’s most prominent two-year vocational schools. The college offers eight degrees and six certificate programs entirely online, all following the same structure as on-campus programs. Among SCC’s online degree options is an office administration degree, which emphasizes proficiency in both technical and non-technical skills. Students learn to use integrated software, build oral and written communication skills, and navigate various office management systems. Graduates are prepared for positions in computerized support environments across industries. The curriculum includes a work-based learning course with an SCC-approved employer of the student’s choice, which provides hands-on experience in office administration. Online students complete a Moodle orientation course prior to beginning classes. With seven locations across Wisconsin, Western prioritizes flexibility for both traditional and online programs. Western offers seven online degrees, available to in-state and out-of-state students, through its membership in the SARA initiative. Students may earn an office administration associate degree online. The 63-credit AAS in supervisory management degree covers professional development strategies, communication, and organizational development. Students gain practical and technological skills needed in today’s administrative workforce. The program's curriculum is similar to Western’s abbreviated technical diplomas in leadership and supervision. However, the AAS degree is more comprehensive and requires six terms to complete. Western's transfer agreements with four local colleges make the college ideal for transfer applicants. Rather than submitting standardized test scores, applicants complete placement testing through Western. With two regional campuses and a robust selection of distance learning programs, Piedmont’s office administration associate degree online program is just one of several online AAS options. The degree requires 67 to 69 credits of introductory business, math, psychology, and communication coursework, and students gain computer skills including typing, word processing, spreadsheets, and data entry. Students begin the program by completing a college student success or college transfer success course, and they conclude the program with a work-based learning or administrative management course. Applicants must submit all prior transcripts and must take Piedmont’s placement test. Optional certificates are available in Microsoft Word, Excel, Access, and Powerpoint. Lenoir's distance learning division encompasses more than 50 areas of study, including an office administration degree online program. The program requires 73 credits over four semesters; no coursework is required during the summer term. Students develop field-specific skills in records management, office transcription, and executive terminology and build general business acumen. Coursework emphasizes advanced communication, computer, and technology skills to help graduates enter the workforce. Students supplement the core office administration curriculum with electives in the humanities, fine arts, and social behavioral science. Students complete a college student success course prior to beginning program coursework, and Moodle orientation and Lancer training courses are recommended but not required. JSCC offers more than 20 career and professional programs at four campus locations in Alabama and through its distance education division. JSCC's online degree in office administration emphasizes technology to prepare graduates for careers that demand expertise in information preparation, distribution, reproduction, and storage. Like all distance education programs at JSCC, the office administration technology degree program follows the same structure and course schedule as its on-campus counterpart. Online courses may be delivered synchronously or asynchronously through Blackboard. While JSCC is committed to providing flexible online education, some programs may require minimal campus visits in addition to online coursework. Online applicants may use the fast-track registration option. Part of a 12-campus system spanning North Carolina, Wake Tech offers more than 30 distance learning programs, including an office administration associate degree online program that requires 66 credits in computerized office procedures, administrative software applications, records management, and advanced office computations. Coursework emphasizes general professional skills, such as oral and written communication, critical thinking, team building, and problem solving. Graduates secure administrative support positions in business, industry, and government environments. The curriculum provides an introduction to office administration in various fields, including tasks specific to healthcare and law. The program prepares students to earn select industry-recognized certifications. Wake Tech also offers related AAS degrees in office finance, office software, and legal office. With three campus locations in upstate New York , ECC has served students for more than 70 years. ECC has recently begun offering career-focused distance learning programs and now offers 11 online degrees and certificates, including an AAS in business administration with an office management concentration. The program covers planning, organization, and processing of computerized information in an administrative work environment, training students on the same computers and office equipment they will use in the workplace. The curriculum covers general professional skills, including oral and written communications and interpersonal relations, as well as specific computer software applications, office information systems, and records and information management. Students may gain additional work experience through optional internships and complete 60 credit hours over two years. SCC offers unique tools to help first-time distance learners identify their educational needs and skills. SCC allows prospective students free online access to its SmartMeasure assessment tool. Among the college’s online degree offerings is the AS in administrative office management, which is ideal for both aspiring and experienced office managers. The program's curriculum combines traditional business courses and business-related liberal arts courses, providing students with the technology skills needed to efficiently manage administrative responsibilities and office staff. Students must complete prerequisites — computer software for college and keyboarding for college — before beginning the program. Students may transfer program credits to a bachelor's degree, such as a BS in business education, at Winona State University. As a participant in the Florida Shines and the SREB electronic campus programs, Daytona State is one of the largest providers of online programs in Florida. Daytona State offers 14 online undergraduate degrees, all of which are available in an accelerated 2+2 model, which involves two years of associate-level study and two years of bachelor's-level study. Daytona State’s office administration degree offers specializations in general, legal, and medical studies. Most students complete the program in two years and take one summer course. The 60 credits of coursework includes classes in information processing, keyboarding and formatting, and advanced computer software applications. Some courses qualify students for additional office support and office management certificates. As part of the SREB electronic campus partnership of North Carolina, GTCC offers more than 25 technical degrees, certificates, and diplomas online. The college upholds its reputation as one of the state’s most dedicated providers of online education through unique requirements such as a mandatory two-week online readiness workshop. Students in GTCC’s online AAS in office administration program gain computing and emerging technology skills, knowledge in business law, and people skills. Students complete 65 credits during four semesters. Elective topics include social/behavioral science, communications, humanities/fine arts, and mathematics. The curriculum prepares students for the Microsoft User Specialist exam. GTCC's priority registration system for online degree applicants processes applications in 7 to 10 business days. With 11 campuses and education centers across northeastern Florida, FSCJ prepares students for advanced professional positions. FSCJ is particularly invested in supplying its local workforce in Duval and Nassau counties with qualified office and administrative support workers through its online AS in office administration degree. The 60-credit program is available in an accelerated format that allows students to graduate after 20 months of full-time study. The program trains students in the industry’s most in-demand skills, including computer software, office systems, customer service, office budgets, human resources, and office management, and general education coursework builds critical thinking, time management, and teamwork skills. The degree features embedded certificates in office management, office specialist, and office support and requires applied learning and internship experiences. Offering more than 250 online courses through its eLearning division, EFSC is among Florida’s premier distance learning institutions. The college’s office administration associate degree online program is ideal for students with a meta-major in business. The program emphasizes general education and tech-oriented professional skills, with optional administrative, legal office, and medical office specializations. Certificates in office management, medical office management, office specialist, and office support are embedded within the degree program. The 60-credit curriculum covers oral and written communication, professional ethics, and digital information management. Applicants must satisfy entry-level assessment prerequisites and complete required developmental education courses in reading, writing, and math. Full-time students complete the degree in two years. For more than 50 years, WCC has offered comprehensive professional and continuing education programs. Today, the college offers 20 online associate degrees, diplomas, and certificates to prepare students for careers in business, emergency management, and criminal justice. Among WCC’s online offerings is an AAS in office administration, which students may supplement with certificates in office administration and Microsoft applications. The curriculum covers word processing, office finance solutions, principles of management, and business ethics. Major electives include a three-part work-based learning course in which students gain hands-on experience from a school-approved employer. The online program's small class sizes allow personalized attention from professors. Although small, SAU Tech is perhaps the most prolific community college in the Southern Arkansas University system, offering dozens of career programs in more than 15 areas of study. SAU Tech offers seven degrees and six certificates online, including the AAS in office management with optional emphases in medical office administration or medical transcription. The program comprises developmental coursework, field-specific courses, and emphasis electives. Students complete 60 credits over four semesters and build expertise in business communications, computer skills, electronic spreadsheets, quantitative reasoning, and records and database management. While about 95% of coursework can be completed online, some elective courses in general office management, including transcription and business graphics, require campus visits. Students must participate in an internship during their final semester of study. Specializing in career and professional programs in business and technology, Broward offers dozens of degrees and technical certificates through its participation in Florida Shines and the state’s electronic campus program. Broward's online AS in office administration offers a specialization in office management, preparing graduates for business support roles. Graduates are prepared to sit for the Microsoft Word specialization certification exam. The required 60 credits include general education, core, and specialization coursework, such as composition, keyboarding and document processing, accounting, and database management. The program also features unique requirements in successful job searching and a co-operative applied learning experience. Related certificates are available in medical office management technical, office specialist technical, and office support. Each school's online degree in office management and administration is slightly different. While topics and courses feature some variation from one program to the next, the section below outlines common introductory courses taken by most students pursuing an office administration degree. Office Accounting: This course introduces the basics of accounting, which are applicable to any type of business or organization. Topics include accounts payable and receivable, cash control systems, close-out methods, receipts, and payroll procedures. Most programs teach students to perform these functions by hand as well as by using accounting software. Computer Applications: Computer application courses provide a broad overview of the primary types of software and programs graduates use in an office administrator position. Students learn the basic functions of the Microsoft Office suite, including word processing, spreadsheet, database, and presentation software programs. Some courses may also emphasize cloud-based computer applications and/or virtual file-sharing tools in addition to basic PC computing functions. Business Communication: This course emphasizes the importance of effective oral and written communication skills in the workplace, through listening, reading, writing, and speaking exercises. Students practice composition and editing techniques specific to business topics and learn about basic grammar and proofreading practices. Administrative Office Procedures: This course outlines the range of tasks regularly required of office administrators in a business office, including maintaining correspondence, scheduling meetings and presentations, making travel arrangements, and implementing organizational systems. Generally, this course focuses on problem-solving, critical-thinking, and decision-making skills. Records Management and Legal Implications: As a primary concern of any medical office, nonprofit organization, or client-based business, records management and legal implications courses teach students to manage both hardcopy and electronic records database systems. Legal requirements concerning the release, retention, and storing of records is also discussed. HOW LONG DOES IT TAKE TO GET AN ONLINE ASSOCIATE IN OFFICE ADMINISTRATION? Most students earn their online degree in office management and administration in two years, although some accelerated programs are available. Other factors, such as whether a student attends full-time or part-time, when classes are offered, and the overall structure of the program, can also affect completion times. Additionally, it is important to determine if a program offers flexible, individual learning or uss cohort model. Self-paced programs provide students with additional flexibility, letting them work toward their degree at their convenience. Alternatively, a cohort arrangement places students in groups that they move through the program with; this format may be appealing because it allows distance learners to network with their peers and collaborate on projects. Online office administration associate degrees typically require students to complete 60 credit hours, which are made up of a combination of core, general business education, and field-specific elective courses. Receptionists are generally responsible for answering phones, greeting visitors, and providing basic information about their organization to visitors and members of the public. They may also perform additional administrative tasks, including scheduling, filing, and correspondence. Receptionists should have an associate degree and strong communication skills. Secretaries and administrative assistants provide clerical and administrative support to coworkers and supervisors in schools, hospitals, government agencies, law firms, and health care organizations. Applicants with an associate degree and work experience are eligible for most entry-level jobs in the field. These professionals typically oversee all administrative functions within an organization, from planning to coordination. Tasks often include office upkeep, mail distribution, and recordkeeping. Most administrative services management jobs require a bachelor's degree and specialized experience in the field. Bill and account collectors require many of the same career abilities students learn in an office administrator program, including strong communication, accounting, and computer skills. Most jobs in this discipline require an associate degree and on-the-job training for one to three months. Information clerks collect, maintain, and disseminate data and information. Most work at hotels, health care facilities, or government agencies. An associate degree and on-the-job training are typically required for entry-level positions. Earning an online associate degree in office administration can open the door to a variety of entry- to mid-level support roles in the workforce. However, while an associate degree meets the minimum qualifications for most jobs in this industry, students who aspire to advanced positions in business, management, or a related field may choose to strengthen their skills in a particular area to enhance their career prospects. Associate degrees in office administration can be transferred to a wide range of bachelor's degree programs in business administration, technology, health care administration, and HR management, among other options. Below are a few of the educational paths available to graduates with an associate degree in office administration. Business Administration: One of the country's most popular college majors, a bachelor's degree in business administration sharpens the basic skills learned while pursuing an office administration associate degree online. Programs typically cover business, communication, and computer skills while emphasizing leadership and management abilities. Students are prepared for advanced roles in marketing, IT, PR, and other business-oriented fields. Office Administration and Technology: Bachelor's-level office administration and technology programs emphasize many of the same business, accounting, and computer skills learned while earning an associate office administration degree; however, students spend more time studying technology, software, and IT applications. Graduates are qualified for office administration jobs that require additional tech or IT experience and/or specialized training in this area. Medical Office Management: Bachelor's degrees in medical office management provide specialized training related to the business, clerical, and clinical skills needed to work in health care facilities. Graduates learn about patient records management, health care accounting and bookkeeping, and clinical filing systems, among other field-specific tasks. Human Resources Management: HR management programs prepare students to lead recruiting, hiring, and staff training efforts for a business or organization. This major typically revisits fundamental concepts learned in an associate degree in office administration program; however, the advanced leadership and organizational skills needed in an HR management role are emphasized. Project Management: Bachelor's degrees in project management are ideal for graduates of an associate degree in office administration program who are looking to build leadership, communication, and teambuilding skills. Coursework covers contracts and negotiations, asset procurement, risk management, and budgeting methods. Graduates with a bachelor's degree are qualified for mid-level project manager jobs in a variety of executive and professional fields. There are many types of federal and state scholarships, loans, and grants that can help you finance your online associate degree in office administration. When you decide to seek financial assistance, your first step should be completing the Free Application for Federal Student Aid (FAFSA) form. Whether your priorities are federal scholarships, individual grants, or work-study jobs, your school will likely require completion of the FAFSA to determine your eligibility for aid. This process also helps you and your family to understand the full scope of financial aid opportunities that are available to you. Aspiring office administrators may qualify for scholarships geared toward students in business, business management, and/or office administration technology programs. Additionally, aid opportunities often exist for low-income students or students who are the first in their family to attend college.